The Castle will be open on Sunday only and can be accessed via the far park gate by the national dressage arenas; there will be a reduced entry price for visitors who have walked through from the Horse Trials. Please be aware it is 10-15 minute walk from the main arena to the Castle itself. Access & Parking– Visitors requiring the accessible car park are advised to follow the directional road signs for the visitor entrance to access the Park (Satnav: LE16 8XJ). There is a limited amount of disabled car parking space, our car parking team will endeavour to park you as close as possible to the trade stands and arenas. Tickets – Tickets can be purchased via our website or on arrival to the park. Each visitor does require the appropriate ticket for the event but an accompanying carer will receive entry free of charge and does not require a ticket. Please be aware that some areas of the park, especially the cross-country course, may not be even under foot. Facilities – There are accesible toilets on site, which will be marked in the event programmes as well as on the ‘you are here’ boards. 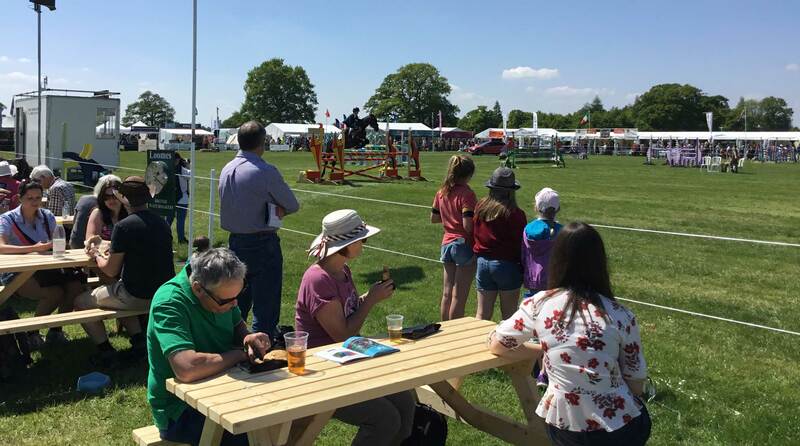 You are very welcome to bring your dog to the Horse Trials, we even have a have-a-go agility course for your four legged friends to show their skills! We do ask that dogs kept on a short lead and under control at the event; this is particularly important when near the cross country course and arenas. If you do bring your dog we ask that you clean up after the dog and dispose of any rubbish in the black bins across the site. Please do not leave dogs in vehicles at the event. They can become distressed and over heat quite quickly especially if the sun does shine! If dogs are found to be in distress we will make every effort to locate the owner but we may need to take further action to release the dog. There are around 70 trade stands selling a range of products. The list of trade stands will be listed on the Trade Stand page around two weeks before the event. There are several food and drinks stands across the site, serving everything from donuts and coffee to pizzas and lamb wraps. You will be able to locate the food stands by the plan in the programme or the ‘You Are Here’ boards around the event site. There is also a licensed on site bar where you can by a range of alcoholic and non-alcoholic drinks; the bar is located in between the main arena and second arena. If you wish to bring a picnic to the event we ask that you clear up any rubbish and dispose of it in one of the black bins across the site. The score sheets for the event will be located in the bar area and will completed as and when information becomes available. Scores will be uploaded to the BDWP event pages throughout the event weekend. A link to the online scores will be posted on our website as well as the Facebook & Twitter pages for the event. Programmes are for sale when entering the car park and can be purchased from the Rockingham Castle Gift Shop. Look out for the programme banners to locate the sale points. Programmes on the day cost £4 but you can purchase one a redeemable voucher through our online ticketing system to collect on arrival to the event. The event runs from 8:30am-5:30pm (approx) with cross country, dressage and show jumping taking place on all days. For more detailed information on individual classes and sections please see our what’s on page. Detailed information and timings and sections will be uploaded a couple of weeks before the event. Alternatively, start times for competitors can be found on BDWP across the event weekend. There are ‘You are here’ boards around the park where first aid points will be marked. In case of an emergency please contact a member of the Horse Trials team in a high viz vest or a Rockingham Horse Trials polo shirt who will be able to radio for medical attention. The parkland is mixed terrain so it is advisable to wear comfortable and sturdy footwear to the event, especially if you are planning to walk the course. The ground is quite hard but if it has been particularly wet wellies or waterproof walking boots are always the best policy. The weather can be quite mixed in May so it is worth preparing for all conditions, just in case! We list our affiliated local hotels on our ‘Where to Stay page’; for smaller B&B’s please visit our Useful Links page on the Castle Website. If you are interested in bringing a caravan along to the event the pitch fee starts at £65 and includes entry for two adults for the three event days. For further information and a booking form please contact Katie Callaghan on 01536 770240, by email on horsetrials@rockinghamcastle.com or by competing the enquiries form at the bottom of the page. There are baby changing facilities located in the Disabled toilets, these will be marked in the programme and on the ‘you are here’ boards. Lost Property will be held at the Secretaries tent facing onto the second arena. If you find anything please hand it to a member of the event team or take it directly to the secretary’s tent. We will hold any lost property for two months following the event after which time it will be donated to a local charity shop. By Car – For Satnavs please use LE16 8XJ and follow directional signs for Corby. Closer to the event you will see yellow directional signage to take you to the correct car park. By Train – Corby train station is a 10 minute taxi ride from the park where you can catch trains for Kettering, Bedford and London St Pancras. If you are travelling from Leicester, Nottingham or Derby you can catch a connecting train to Corby from Kettering Train Station.